"As numerous thinkers have noted, cats often have a soothing quality on their owners. Granted, the economy is looking as shaky as a newborn kitten at the moment, but imagine what condition it might be in now without Sybil." 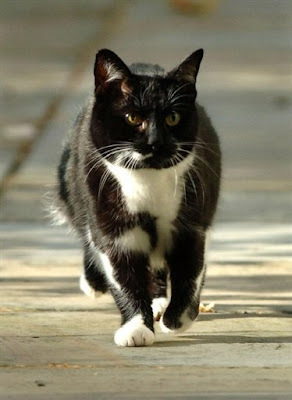 Now comes the sad news that the former First Feline of 10 Downing Street in London, Sybil, has died. Press reports are sketchy and contradictory, but apparently she died July 27th at the London home of an acquaintance of her former owners, Chancellor of the Exchequer Alistair Darling and his wife, Maggie. Neither the cause of death nor her age have been disclosed. All that is known is that she died after a brief illness. She could have succumbed to natural causes or been deliberately killed off by her new guardians simply because she had become ill. Since the Darlings are keeping mum on the subject and Fleet Street has decided to play along, the public likely will never know the truth surrounding her death. Since Prime Minister Gordon Brown and his wife, Sarah, elected to bunk at roomier Number 11, Sybil and the Darlings moved into Number 10 where she initially was given free rein of the grounds. She even was given her own basket at the Exchequer. For some undisclosed reason, her tenure at 10 Downing Street turned out to be a brief one and she was unceremoniously dismissed after only six months on the job. According to unsubstantiated reports that have appeared in the English media, Sybil was given the sack because of Brown's antipathy not only toward cats but all animals in general. 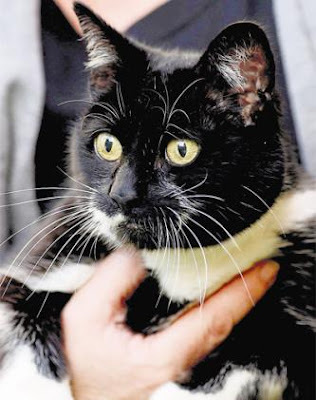 Regrettably, not a great deal is known about Sybil other than that she was adopted from a shelter by the Darlings and named after Basil Fawlty's wife from the 1970s sitcom, Fawlty Towers. Nevertheless, her meteoric rise demonstrates that she was an overachiever. Although her tenure was indeed brief, Sybil nevertheless left her indelible mark on both the Darlings and the office of the Exchequer. "As numerous thinkers have noted, cats often have a soothing quality on their owners," The Independent eulogized her on July 29th. (See "Feline Friends.") "Granted, the economy is looking as shaky as a newborn kitten at the moment, but imagine what condition it might be in now without Sybil." Since no funeral or burial plans have been announced, it is pretty much a given that Sybil was deprived of both and that in and of itself is a disgrace. Even a tombstone and a permanent memorial would not have been extravagant. Photos: BBC (Sybil on the go) and Press Association (Sybil up close).